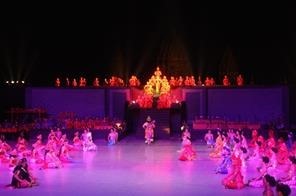 Sendratari Ramayana, or Ramayana Ballet, is a performance held at night in the stage inside the Candi Prambanan complex of Yogyakarta Special Region and Central Java Province. The performance, a visualisation of story carved in the candi itself, is a combination of traditional Javanese dance and drama epoch accompanied with the sound of Gamelan orchestra, a traditional Javanese set of instrument. In the performance, there is no dialogue. The story is performed using dances and the songs in Javanese sung by sinden, singers of the orchestra. Hundreds of dancers are involved in the ballet, not to mention all the musician (niyaga) behind the gamelan, so yes, it is a big and complex stage. Although the sinden sing in Javanese, don’t be afraid because there are narrations in Bahasa Indonesia and in English alongside the ballet. In the entrance, there are also brochures with summary of the story in other languages than Bahasa Indonesia and English. Ramayana comes from rama and ayana, means Rama’s Journey. It is an Hindu story written by Valmiki, and has been adapted in various forms across South East Asia, including Indonesia. 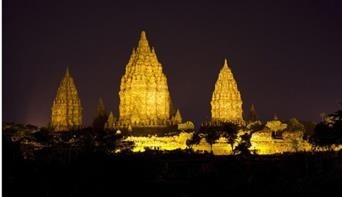 The Ramayana story itself is carved on the wall of Shiva temple, the main temple of Prambanan. In the day before the ballet, do visit the temple and walk clockwise (pradaksina) to see the story on the relief. The ballet tells a part of Rama’s life in his adventure to save Shinta after she is being kidnapped by Rahwana, king of Alengka. Ramayana ballet is divided into 4 episodes: The Kidnapping of Sinta, Anoman Mission to Alengka, Kumbakarna and Rahwana’s Death, and The Meeting of Rama and Shinta. The story starts with Shinta, daughter of Prabu Janaka, having a contest to decide who to marry. Rama Wijaya gets to be the winner and marry Shinta. Come Rahwana, King of Alengka who wants to marry Shinta. He gets one of his follower to turn to a deer to attract Shinta. Shinta is truly attracted to the deer and asking Rama to hunt it. Although Rama and his brother Laksmana left Shinta inside a protective barrier, because of Rahwana’s trick, Shinta can be kidnapped. Hanoman or Anoman, a white monkey, offer to help Rama to go to Alengka to get Shinta’s back. Alt hough getting arrested and burned, Hanoman can escape and use the fire to burn Alengka. Although Shinta can get back and Rama can kill Rahwana, Rama doesn’t believe that Shinta isn’t tainted. Shinta is asked to burn her body to prove it. Shinta can, and in the end they ca n be together again. The two hour performance is very dynamic, from charismatic performance of Rama, graceful dance of Shinta, the brusque Rahwana, until humorous behaviour of the monkeys. Other than dance, you can also see interesting scenes of fireplay and acrobatic. 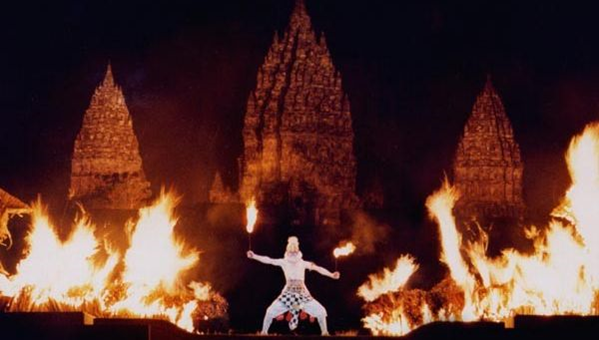 Fireplay can be seen in the scenes of Hanoman burning Alengka and Shinta burning herself alive and Hanoman and the monkey brigades battling with Rahwana’s army including acrobatic scene. Not only the dance and the music, the lighting is also being prepared as well to get people connected with the scenes. After the ballet, you can also take photos together with the dancers, so remember to bring your smartphone or camera. Ramayana Ballet previously was only performed on full moon in the Ramayana open stage inside the Prambanan complex, south of the temple in the dry season, but now performed three times a week on Tuesday, Thursday, and Saturday from 19.30 to 21.30. It is performed in both outdoor (dry season) and Trimurti indoor stage (rainy season), every night nonstop for more than 25 years in Purawisata (Brigjen Katamso Street, eastern of Kraton palace, 20.00-21.30), and every fullmoon in open stage Balekambang Park, Surakarta , Central Java (20.00-22.00). For only the first week of May until October, performances will be held for 4 nights in a row, one episode each night in Ramayana open stage. The ticket prices are varied for special, first class, second class, VIP, and students in group with school permission. Although it is alright to watch the one scheduled near your stay in Yogyakarta, the Ramayana Ballet is best watched in the open stage with full moon and the temple in the background. The Anoman Obong stage with Anoman burning the Alengka is truly magnificent with the fire under the moonlight. It is better to arrange your schedule, check the calendar, and book the ticket. If you can have the time around May until October and at full moon, I suggest you to reschedule your other activities and watch the Ramayana ballet. If you can’t, you can still watch it on other scheduled date or go to the performance every night in Purawisata’s indoor stage. Posted on May 7, 2014, in Culturing, Scattering and tagged ballet, culture, indonesia, ramayana. Bookmark the permalink. Leave a comment.